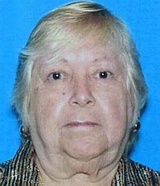 Gloria Jean Sancho, a 73-year-old Latina, was found dead Tuesday, Feb. 17, in the 9600 block of Kruse Road in Pico Rivera, according to Los Angeles County coroner’s records. About 9:30 a.m., Los Angeles County sheriff’s deputies were called to a home in the area and found Sancho on the kitchen floor with an apparent gunshot wound. Her husband, Antonio Sanchez, a 68-year-old Latino, was beside her with a self-inflicted gunshot wound, according to a news release from the Sheriff’s Department. Gloria Sancho was pronounced dead at 10:01 a.m. at the home, according to coroner’s records. Investigators found that the Sanchos, who lived at the home, had been married about 13 years. The couple was in the process of getting a divorce and selling their home. Family members told the Whittier Daily News that Gloria Sancho had a court hearing in the divorce proceedings the day the bodies were found. Gloria Sancho’s cousin told the newspaper that the woman took care of her disabled son, who was home at the time of the shooting but was not injured.